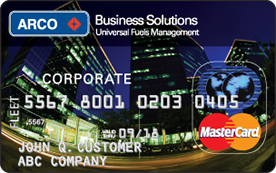 This card offers spending flexibility, the freedom to use the cards wherever you need, detailed cost analysis, individual card control, and incremental rebates that deliver more for your fleet management system. We make it easy to control your company’s expenses. Set prompts to ask for vehicle or driver number. The transaction will not be completed without the correct number. You can also set prompts to ask for the odometer reading to keep track of mileage for the MPG report. Reporting includes a variety of comprehensive data, which you can sort by exception, driver, vehicle, MPG reading or several other options. Security codes control your company's fuel expenses and identify fraud. With the ARCO Business Solutions Mastercard, your account info is available online in real-time 24 hours a day, 365 days a year. Immediately monitor account data information for each driver and control purchasing ability for each card, including the ability to shut off cards or request new cards. Start saving money for your fleet business today by choosing the right one. Fleet managers can save anywhere between 10 -15% when selecting a fuel management solution. Just answer a few questions about your fleet and one of our experts will recommend the right fleet card program tailored to fit your business needs. *What is TOP TIER™ Gas? To learn more, visit toptiergas.com. Average savings based on March 2017 - March 2018 Lundberg Price Survey weighted average industry street price among major brands for all three gasoline grades in the following marketing areas: Los Angeles, San Diego,Phoenix, Las Vegas, Reno, Bakersfield, Fresno, Seattle, Portland, Eugene,Sacramento, Stockton, and San Francisco.